Theo Rossi “Juice” and Tommy Flanagan “Chibbs”, to replace Charlie Hunnam at Chicago Motorcycle Show. An unexpected movie deal has changed Charlie’s availability and he will not be able to attend the Chicago show but in true Pres style. He has selected two representatives from sons of anarchy to come meet the fans in his place. Theo Rossi ”Juice” and Tommy Flanagan “Chibbs” will be on location Saturday to meet and greet with fans, sign autographs and represent SOA. Details of the changes are still being finalized a full schedule of appearance times etc will be updated after Christmas. 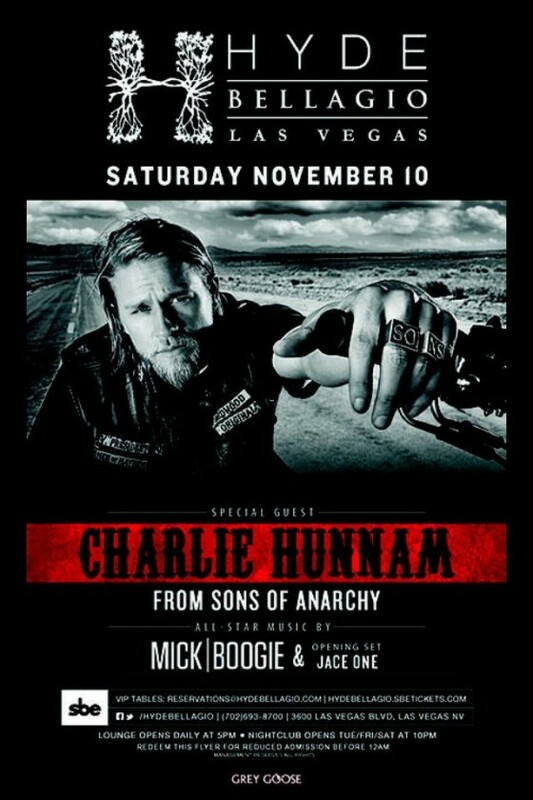 Charlie to host Hyde Bellagio in Las Vegas November 10th! Charlie is scheduled to host Hyde Bellagio in Las Vegas this coming Saturday on November 10th! The lounge open at 5PM and the nightclub opens at 10PM. You can use this flyer for a reduced admission before 12AM, as noted on the flyer itself! Check out the Hyde Bellagio on Twitter & Facebook! Charlie scheduled for the 29th Annual Chicagoland Motorcycle Show & Parts Expo! Great news Illinois Sons of Anarchy fans! Charlie is now confirmed for the 29th Annual Chicagoland Motorcycle Show & Parts Expo on January 19th & 20th next year! Don’t miss your chance to meet Charlie, so buy your tickets at EVENTBRITE.COM today! SAMCRO continues to bring Bikes, Bullets and Blood to the small screen on FX’s hit show Sons of Anarchy and now Charming Chapter President Jax Teller (played by Charlie Hunnam) is facing challenges to the club, his family, his business and his life every Tuesday night. For the first time ever Jax will be making an appearance Chicago Saturday and Sunday at the 29th annual Chicago Cycle Show in St Charles, IL at Pheasant Run Resort. Jax will be on site to present trophies at our custom bike show awards Ceremony on Saturday, He will give a panel discussion about making the show, becoming a biker for TV and answering fan questions on Sunday. and autograph Sessions will be available both Saturday and Sunday. 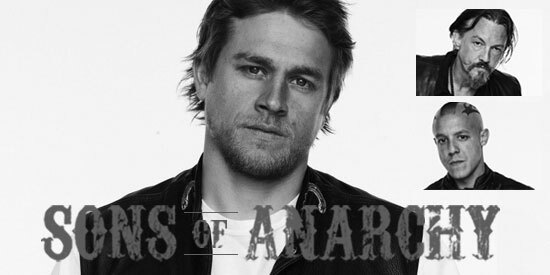 Order tickets now to see Charlie Hunnam in Chicago at the Chicago Cycle Show! 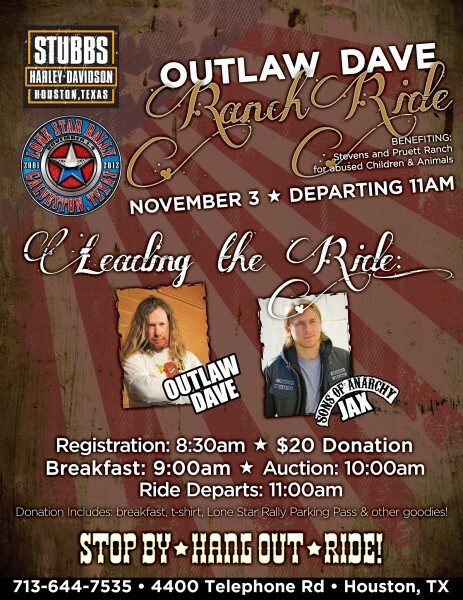 The ride will be held on November 3rd and starts at Stubbs Harley-Davidson in Houston Texas and ends at the Lone Star Rally. Police Escorted the whole way to Galveston. If you want to be closer to the front, along with the VIP guests you should get there early! Be sure to check out STUBBS Harley-Davidson on Facebook! 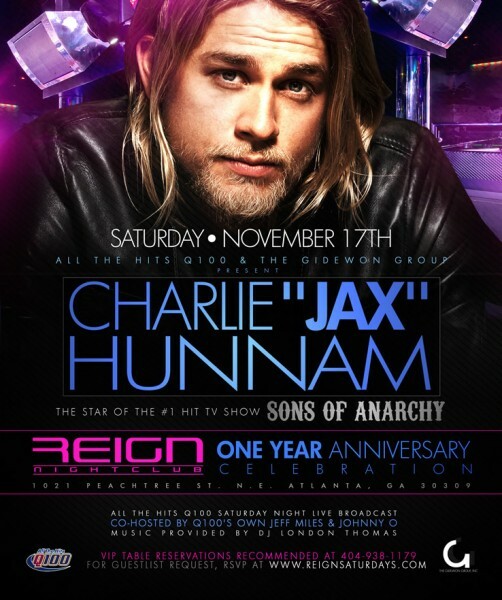 Charlie scheduled to host One-Year Anniversary Party at Reign Nightclub! Good news East Coast! Another appearance has been scheduled, and this time it’s in Atlanta, Georgia! Charlie is now scheduled to be at Reign Nightclub and host their One-Year Anniversary party on Saturday November 17th! – you should find all the details you need for this upcoming event on the flyer below! The guest list referred to on the eflyer is for free admission before midnight. The signup will be active on REIGNSATURDAYS.COM beginning tomorrow (Tuesday) 9am east coast time. Charlie is said to be arriving that evening around 11:30pm/11:45pm, so don’t be late! Charlie no longer scheduled for Dusk Nightclubs ‘Bada$$ Halloween’, date moved to November. Sad news for those of you planning to attend the Bada$$ Halloween event hosted by Dusk Nightclub in Atlantic City on October 27th, because it seems Charlie has had to reschedule. However, he will be hosting on November 16th instead. So be sure to head on over to the new link below to get your tickets before they sell out! Unfortunately Charlie Hunnam has rescheduled his appearance at Dusk from Oct. 27 to Friday Nov. 16 due to filming for a new movie. We are still having one BADA$$ Halloween and are happy to announce that The Devil From Acapulco will be hosting and performing live. For those of you who have purchased tickets expecting to see Charlie Hunnam, please refer to the email we sent you. Due to popular demand, another day added to the Lone Star Rally appearance, more VIP Meet & Greets with Charlie! 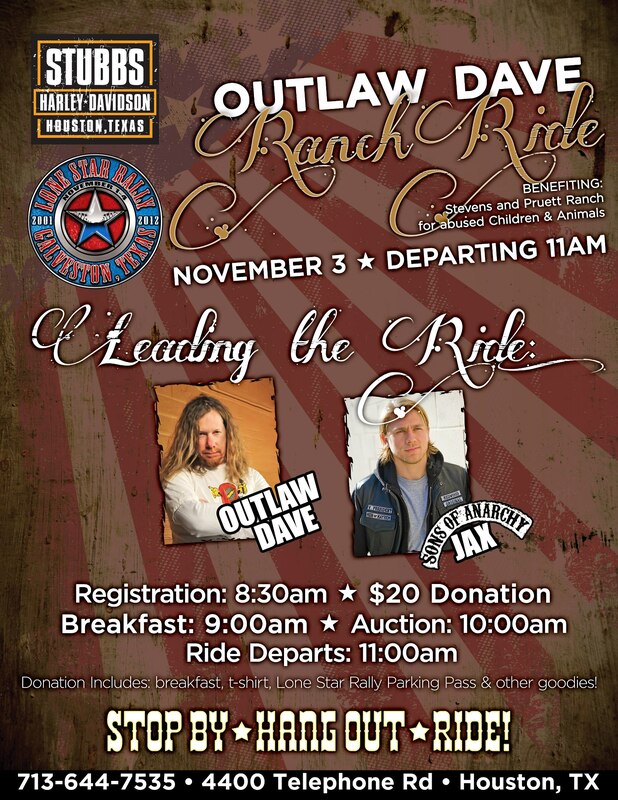 Great news for those of you planning to attend the 2012 Lone Star Rally! Due to popular demand, Charlie has decided to come in a day early and in doing so they have added three more VIP Meet & Greet packages for those who might have missed out on the first one! So mark the date, and don’t miss your chance! JUST ADDED…DUE TO POPULAR DEMAND…CHARLIE HUNNAM “JAX” WILL BE COMING IN EARLIER ON FRIDAY AND DOING THREE ADDED VIP-MEET & GREETS. THESE ADDED EXCLUSIVE VIP MEET & GREETS WILL BE LIMITED TO 75 PEOPLE PER TIME SLOT. TIME SLOTS WILL BE FRIDAY NOVEMBER 2 FROM 2:15PM-3:30PM, 3:45PM-5PM, AND 5:15PM-6:30PM. 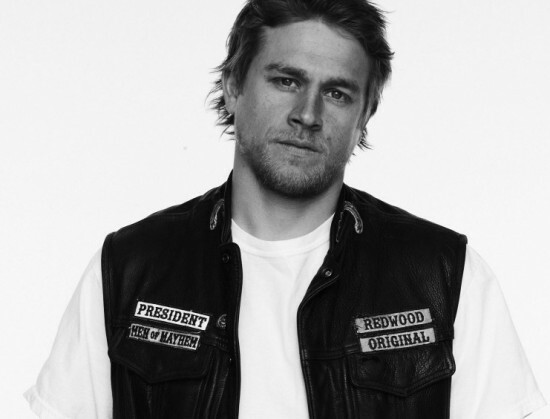 DON’T MISS YOUR CHANCE TO BE A PART OF ONE OF THESE EXCLUSIVE VIP-MEET AND GREETS WITH CHARLIE HUNNAM “JAX” FROM SONS OF ANARCHY. ALL THREE TIME SLOTS WILL GO ON SALE AT 2PM SHARP ON THURSDAY OCTOBER 11. ONLY 225 PEOPLE TOTAL WILL BE ABLE TO REGISTER AND IT IS ON A FIRST COME FIRST SERVE BASIS. THESE 225 PEOPLE WILL RANDOMLY PLACED IN THE THREE TIME SLOTS ABOVE – 75 PEOPLE PER TIME SLOT. 2:15PM-3:30PM | 3:45PM-5:00PM | 5:15PM-6:30PM – THE LOCATION WILL BE ANNOUNCED EARLY NEXT WEEK. * Cash bar is also available for alcoholic beverages. One item of your choice that you bring which he will autograph. Professionally taken photograph of you & Charlie Hunnam taken by the Official 2012 Lone Star Rally photographer. A picture of yourself and Charlie Hunnam taken by the camera of your choosing.